We have two of these just incase we have to burn one due to possesion. 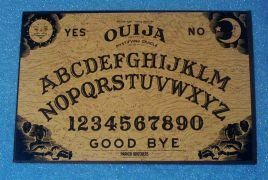 Spirits have been known to become attached to boards and follow you home. We have only burned one board during our 6 years of hunting and it burned many strange colors. Im still waiting to burn another one so we can see if its sopposed to exude white, green, purple, and pink flames! 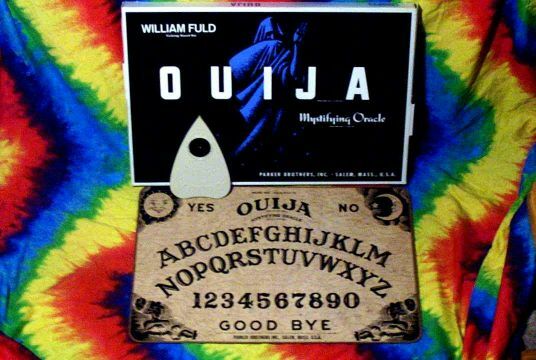 This is the staple of most ghost hunts and its the only proven way we have to make contact with spirits. There are two variations of this board. 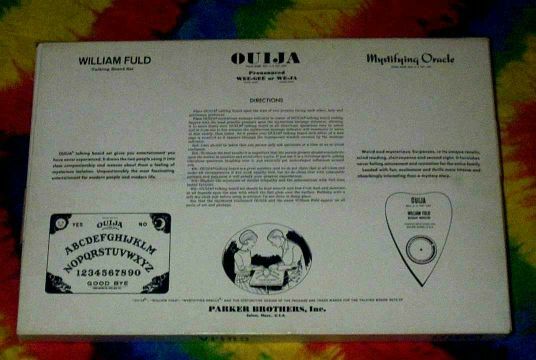 You can find much older William Fuld's that were made in Baltimore, Maryland. These older ones are from around 1919 to 1930. The newer ones were made in Salem Mass :). This is the kind im after. They are much later from the 50s-70s. The latter is alot less expensive and I hope to get one soon. I found this perfect board from a wonderful Grandmother in Texas. She was kind enough to devulge a little history on the board and also provide us with some high quality pics! If your looking for good prices on great items, theres none better than Grannys-Gotta-Have-It. View all her auctions here and buy away! 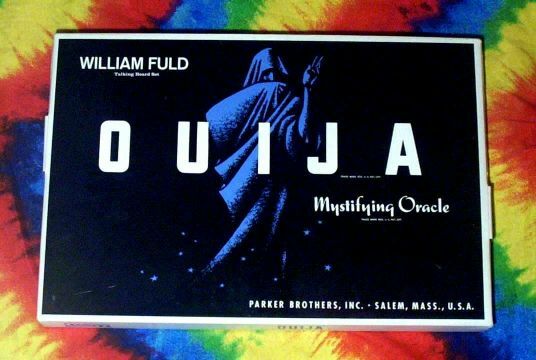 That Ouija you have just won has moved by itself during a seance. One Halloween during a full moon we saw it fly off the board when no one was touching it! It scared my sister so bad she now believes in magic, witchcraft, and ghosts! This is without a doubt the strangest talking board in existence. It glows in the dark (!) and has a marble tunnel for play. You ask your question and then spin the marble around the ring like a roulette wheel. The "eye of Zohar" follows your every move. 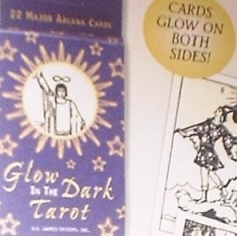 Im gonna hold out on this one until I can find it with the originally included tarot cards on ebay. These are for use in the Ka-Bala's tarot "wells"
This is one of the few boards that has been really innovative in the last twenty years. 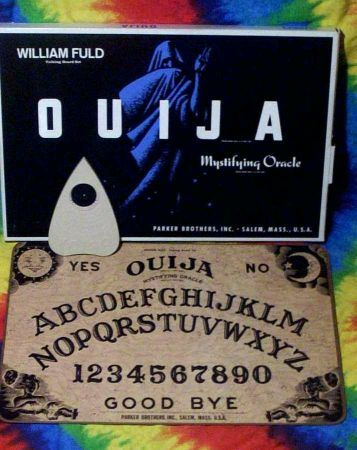 Conceived as an Ouija competitor, this board's design draws from many macrabre details. The letters and numbers of the board have been crafted after gravestones in Salem, Mass. One of the most interesting things to me is that the letters go around the numbers in a figure eight pattern. 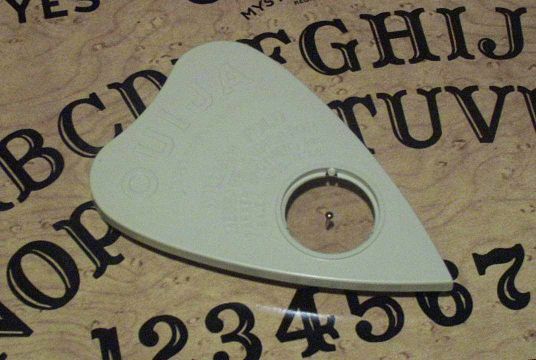 I have always been taught that when the planchette moves in this pattern you are allowing it to build up energy that could be projected into our dimension. I guess the Crpytique designers have never heard of that. This board has had two revisions of the original that I know of. I am the proud owner of Revision 2. 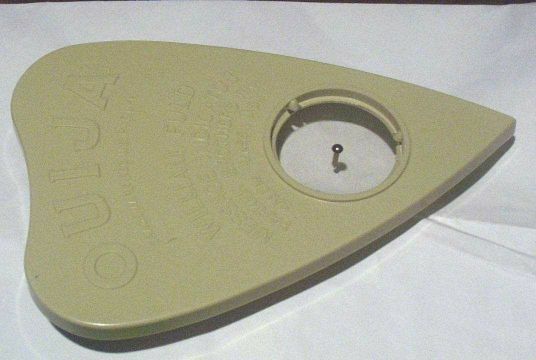 The unique planchette of this board is worth noting too. Ill let you know how it plays when it arrives and we test it out on a hunt. 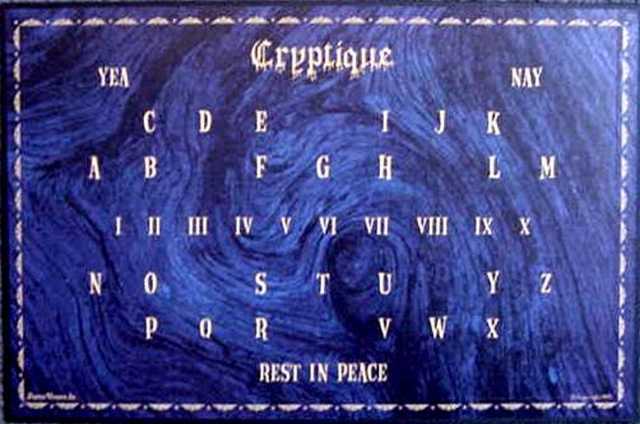 Cryptique® fulfills the legacy of over one hundred years of spirit boards. Inspired by the headstones of the old burial grounds of Salem and Marblehead, Massachusetts, Cryptique pays homage to those graveyards , reflecting the unique style of funerary art found only in New England. Cryptique draws its inspiration from these silent monuments to the dead, chiseled into the stone of the crypt, carved into the wood of the wizened trees that watch over the decrepit graves, and adorned by the winged skull, a powerful symbol of our impending mortality. Through this doorway is revealed a glimpse of our darkest superstitions and deepest fears. 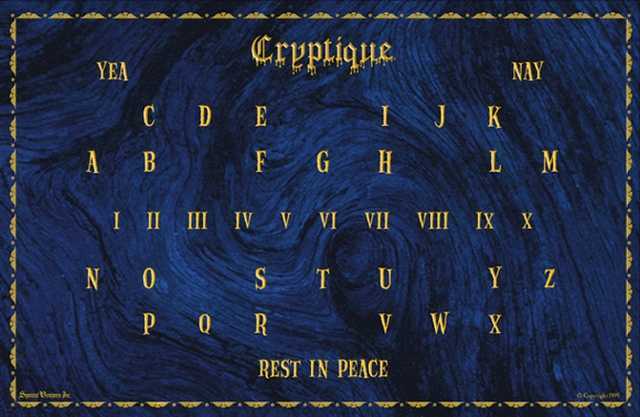 The tomb of Cryptique beckons the curious to sit spellbound and discover the mysterious realms of the unknown. Cryptique was created in the setting of one of America's most infamous events, the Salem Witch Trials of 1692, and thus inherits the mark of that perilous time. The Prussian blue wood background of the board was crafted after trees found at Old Burial Hill in Marblehead. The golden lettering conjures visions of candlelit parlours. Gliding across the board is the gravestone seer, bearing the winged skull found at Old Burial Point in Salem. The epitaph reads “Let the Spirit Move You®,” calling us to explore the realms beyond death. By removing Cryptique from its tomb and gently placing your hands upon the seer, you allow your imagination to take hold while your skeptical nature loosens its grip. How or why it works becomes unimportant. Stripped of doubt, you are left simply to witness the messages that emerge. Talking boards are a class of board games that were introduced to America in the late 1890s. Over the last century, these "games" have brought endless hours of entertainment to those who have ventured to play. 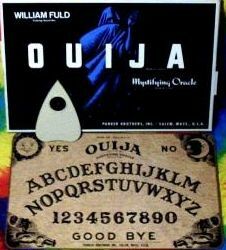 Spirit boards, witchboards, magic boards, & mystery boards are all guises of the talking board. Though countless theories have emerged to explain how & why talking boards work, they remain cloaked in a shroud of mystery to this day. From the bloodline of the mysterious talking board, Cryptique brings this classic game into the 21st century. 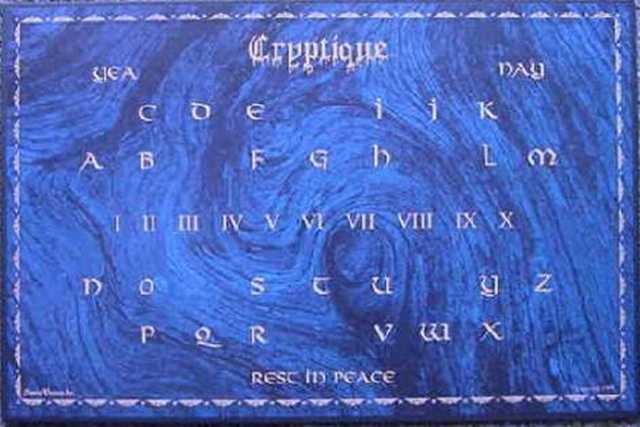 Four years in the making, Cryptique is the first talking board designed exclusively for the new millennium. Its unique design was conceived in 1997. The distinctive layout & artwork mirror the talking boards mysterious past. Fashioned after a century of talking board history, Cryptique combines the spirit of its ancestors with modern creativity to create a look & feel with genuine vision. Shunning a disturbing trend of other talking board manufacturers, Cryptique doesnt skimp on the boards size; measurements are 17" x 11". This generous surface area allows for uninterrupted sessions due to insufficient playing room. There are no fold lines on Cryptique, so the seer will glide smoothly across the entire board. 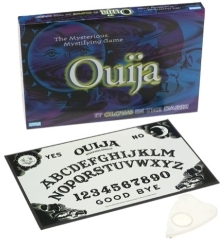 The board itself is constructed of paper applied to covered 100 point chip board, while the seer consists of a label applied to a specially molded piece of plastic. 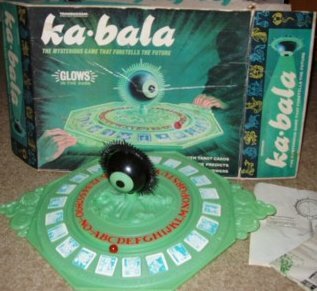 Contains game board & moveable seer. Instructions on use are on the back of the box.